How do you spell “uproarious”? 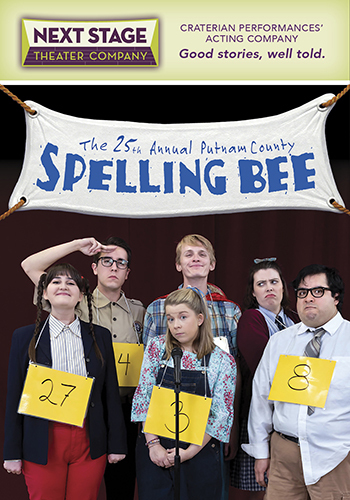 This Tony Award-winning charmer takes place in a middle school gymnasium, where a handful of puberty-plagued nerds and brainiacs—overseen by grown-ups only marginally more developed—contends for the prize of the top speller in the county. A tuneful, poignant, hilarious look at the travails of competition, The 25th Annual Putnam County Spelling Bee has been called “A Chorus Line with pimples” by The New York Times. This production is brought to you by the Craterian’s Next Stage, the same company that won critical acclaim with last season’s production of Next to Normal. Don’t miss this “rarity of rarities—a supersmart show that is also a bonafide crowd-pleaser” (The Wall Street Journal).